Dolphins are beautiful ocean creatures, known for their grace and joy. They are often displayed as star attraction in the zoos and amusement parks. Dolphins are loved by both kids and adults for their socially gregarious nature. Dolphins are highly intelligent mammals related to porpoises and whales. They are found worldwide in shallow seas and oceans. Certain species of dolphin can be found in rivers as well. 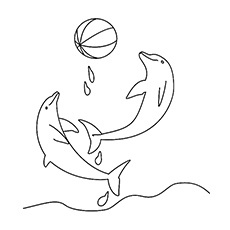 Here is our collection of twenty dolphin coloring sheets for your budding preschooler. 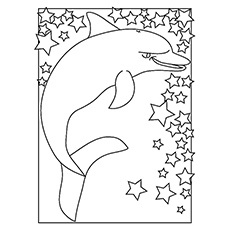 These dolphin coloring pages printable are very popular with kids of all ages. 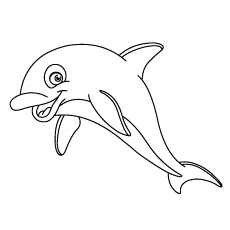 Here is a small collection of free dolphin coloring pages to print out for your kids, highlighting different species of dolphin. 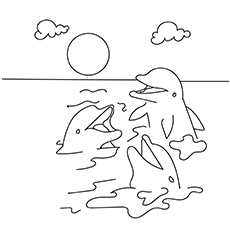 Get your child excited for his next trip to the beach with this Bottlenose dolphin coloring sheet. Bottlenose dolphins are universally loved by both kids and adults, as they always seem to be smiling. Bottlenose dolphins are large, with size ranging from 10 to 14 feet. They have a sleek, streamlined body which helps them move through the water with ease. These dolphins have a very smooth skin that feels like a rubber when you touch it. They usually live in group called pods. They use sounds like squeaks and whistles for communication. 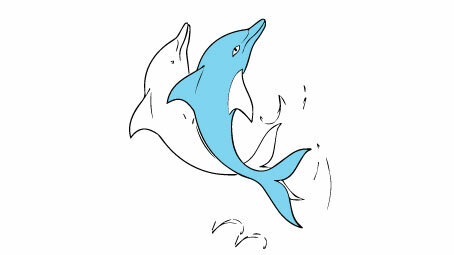 Here is a coloring sheet of a spinner dolphin jumping out of the warm ocean water. Spinner dolphin is one of the most sociable dolphins. They make the most spectacular view with their jumps, flips and spins outside the water. Spinner is a small and slender dolphin. This dolphin is usually found in the tropical water around the world. It is a member of the Delphinidae family. These dolphins have tripartite color patterns. They have dark gray on the back and light gray on the sides. They have white or light gray on the belly. 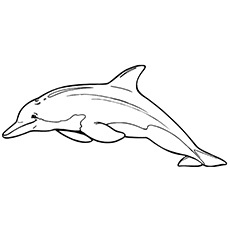 Ask your child to use these colors while coloring this dolphin. 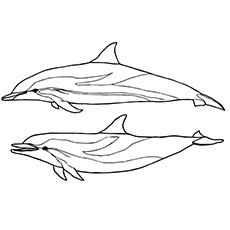 Here is a nice coloring sheet of a pair of Striped dolphin swimming in the ocean water. They are usually found in warm water bodies across the world. Striped dolphins have identifiable striped patterns on their body. These dolphins have a blue body with white stripes. The stripes can be light gray or cream in color. Striped dolphins are also referred to as streakers in some location because of their ability to move rapidly in the water. 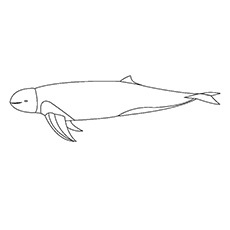 Here is a coloring sheet of Chinese white dolphin for your kids to color. These dolphins inhabit the waters of Southeast Asia. Chinese white dolphins have a round body design that allows them to move around well in the water. They are fast swimmers and can move easily through the water. Chinese white dolphins are either gray or white. Some also have a pinkish tint, depending on the location they live. They are born black, but turn gray and then pink when they are young. The dolphin you see diving in the sea in this picture is the Atlantic spotted dolphin. These dolphins are known for their unique spots that they develop as they age. The Atlantic spotted dolphin is usually found in the oceans. They are also found in the United States, Europe and Bahamas. The top of their body is dark gray or dark black with white patches underneath. 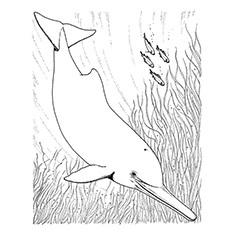 This coloring sheet features Clymene dolphin, one of the most commonly found dolphins in the world. Clymene dolphins are slender in built that help them move through the water with ease. They look very similar to spinner dolphin in appearance. Clymene dolphin has three different layers of coloring. The top is dark gray, beak is light gray and the underside is either pink or white. Clymene dolphins are found in the tropical and subtropical waters of the Atlantic Ocean. Here is a coloring sheet of Commerson’s Dolphin, one of the rarest dolphin species. They are named after Philbert Commerson, who first saw them in the Strait of Magellan. Commerson’s Dolphin is known by different names like Panda Dolphin, Skunk Dolphin and Piebald Dolphin. They have a round body that is tapered at the ends. This enables them to swim fast. They have a distinctive color pattern. The demarcation between the two colors black and white is very clear cut. The dusky dolphin is a small species of dolphin and is closely related to the Pacific White Sided Dolphin. The dusky dolphin has a bluish black tail and fins. Its belly is white and the lower jaw and snout are dark in color. They are usually found in the coastal waters of the Southern Hemisphere, mainly in New Zealand. Ask your child to spot New Zealand in the world map after coloring this picture. 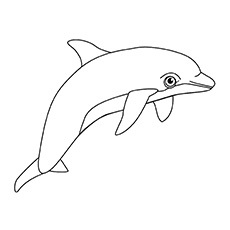 This is a coloring sheet of Indo-Pacific dolphin, one of the most popular bottlenose dolphins in the world. The Indo-Pacific dolphins have long and sleek body and long noses. They have a dark gray or black body and white or gray underside. They are mostly found in China, Australia, Red Sea and Africa. Hector’s Dolphin is one of the rarest dolphins in the world. It is also known as one of the smallest marine dolphins. This specie of dolphin is named after Sir James Hector, a New Zealand scientist. The Hector’s dolphin is found in the coastal waters of New Zealand. The Hector dolphin has a torpedo shaped body, which becomes narrow at the end. They are usually light gray with white or cream sides. The long-beaked dolphin you see here is called Amazon River dolphin. As the name implies, Amazon River dolphins can easily survive in freshwater. Amazon River dolphin is one of the four species which can thrive in fresh water. Amazon River Dolphins vary greatly in size and colors. Some of the common colors include gray, black, brown, pink, white and yellow. 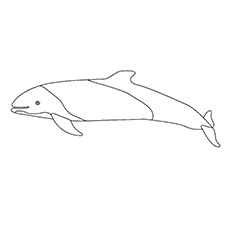 This is a coloring sheet of Irrawaddy dolphin. The Irrawaddy dolphin has a distinct appearance. It has a large, blunt, rounded head with no beak at all. Ask your child to use gray or dark blue for this dolphin. Irrawaddy dolphins have flexible necks that account for creases on the back of the head. They have a small dorsal fin that is triangular in shape. The Irrawaddy dolphin is found around Philippines and the northeastern part of India. They usually live in pods with small number of dolphins. Are you practicing letters with your child? 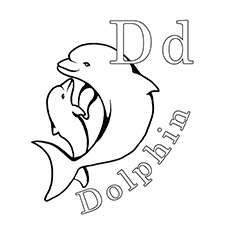 Then here is a D for Dolphin coloring sheet for your child. 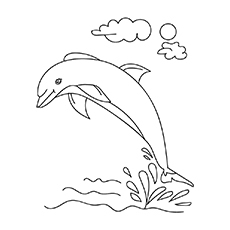 This fun alphabet coloring sheet will have your kid color a diving dolphin while learning the shape and sound of the letter D.
Tell your child to memorize the spelling of Dolphin. This will improve their learning skills. 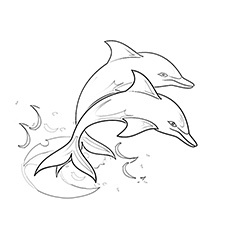 This coloring sheet features a pair of dolphin having a great time playing in the waves. Print out a couple of these coloring sheets to let your child enjoy the coloring session with his friends. Dolphins are colorful animals and are known to surf, spin and do acrobatics just for fun. Ask your child to color the dolphins in contrasting colors. Do not forget to color the waves and the sky. 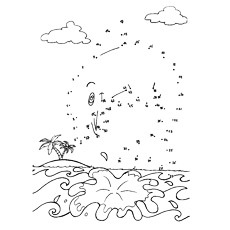 This coloring sheet shows a dolphin soaring as he takes a giant leap across the waves. Did you know that dolphins rest half their brains at a time and other half remaining alert to watch for the predators? They also sleep with one eye open. 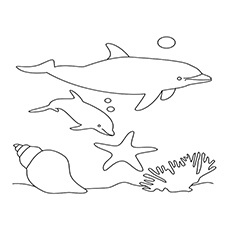 You preschooler will surely have a great time coloring this simple ocean scene. What is the best thing about being a mermaid? They get to be friends with all the underwater animals. 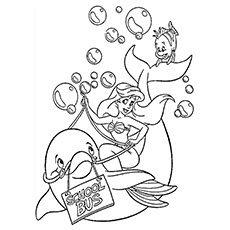 This coloring sheet shows Ariel, the little mermaid hanging out with Flounder and her beloved dolphin. Your little animal lover will surely have a gala time giving color to this fun scene. The dolphin you see here pulls Ariel’s chariot. He is an extremely close friend of Ariel. The mother-child duo is having a fun time swimming in the waves. Your little ocean lovers are sure to enjoy filling colors in the sweet picture featuring mommy dolphin with her baby. This coloring sheet, with its simple outline is great for the young learners. It will help strengthen the fine motor muscle that they will need for writing later on. This lucky girl has got the chance to meet her favorite animal. Does your child also dream of meeting some dolphins? Then hand him this coloring sheet. 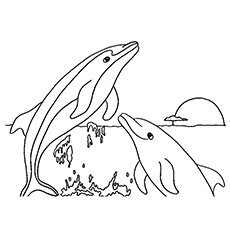 The coloring sheet features a young girl looking at a pair of happy dolphins in amazement. It will also teach your child to color inside the lines. This coloring sheet is perfect for children who are curious about the animal world. It features three happy dolphins playing with each other. Dolphins are one of the friendliest animals. They are also known to save the lives of other species, including humans. As your child colors this sheet, talk to them about other ocean animals and their distinctive characteristics. Do you know that dolphins can talk? Yes, they communicate through their clicking and whistling sounds. 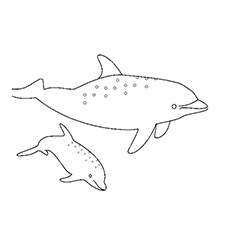 Teach your child more about dolphins with this dot-to-dot coloring sheet. This coloring sheet will also help your child with pencil control for better writing. 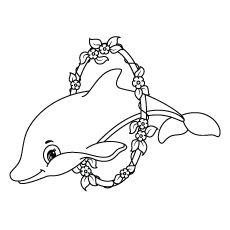 These free printable dolphin coloring pages online are perfect for kids of all ages. They will improve their knowledge about the marine mammals and help develop your child’s artistic and creative skills. You can also use these images in digital scrapbooks or school projects. 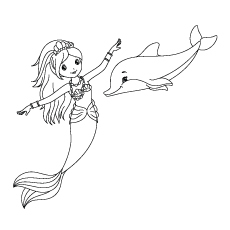 Moms, do let us know if your kids enjoyed these coloring pages of dolphins!